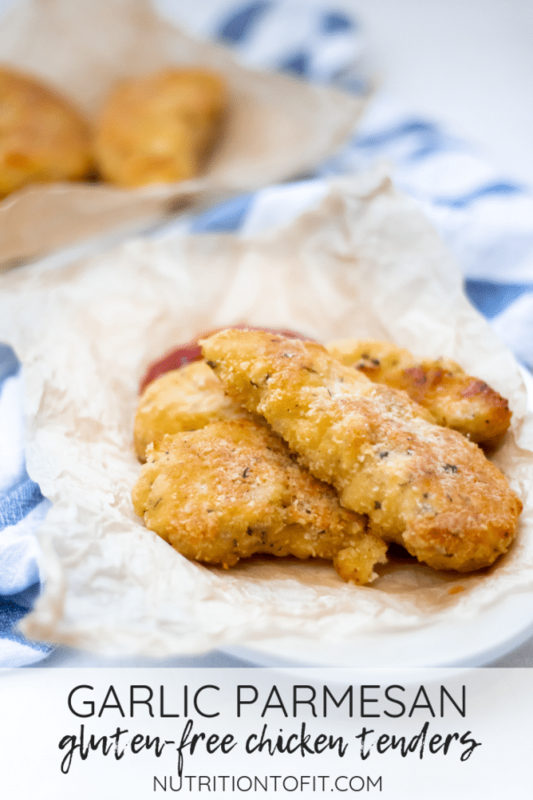 Gluten-free garlic parmesan chicken tenders are a kid-friendly dinner full of flavor. 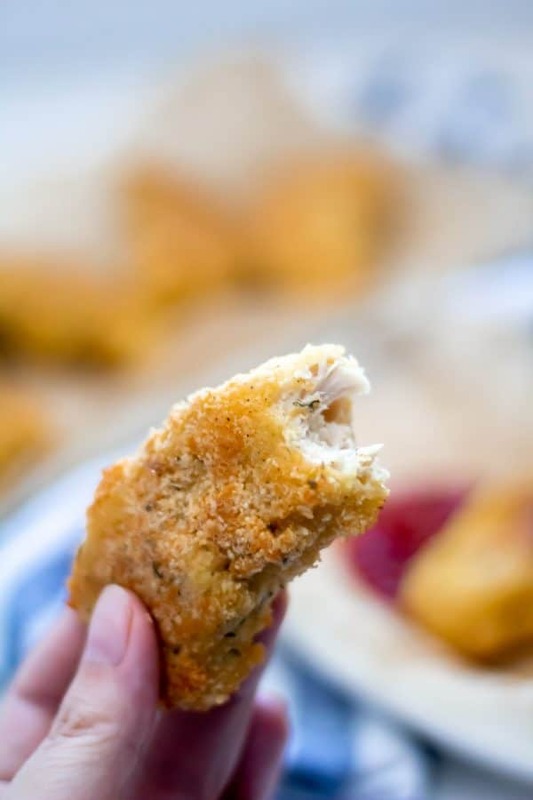 This healthy chicken tender recipe is a low carb, baked chicken tenders recipe everyone will love. As I’m nearing the end of this pregnancy, I’ve been on a total comfort food kick. And while I don’t like banning any foods entirely (except for allergens! ), I really appreciate healthier twists on some comfort food cravings. Energy levels aren’t at their highest being full term pregnant chasing around a two-year-old, so I need food that will sustain, energize, and nourish me and my family. 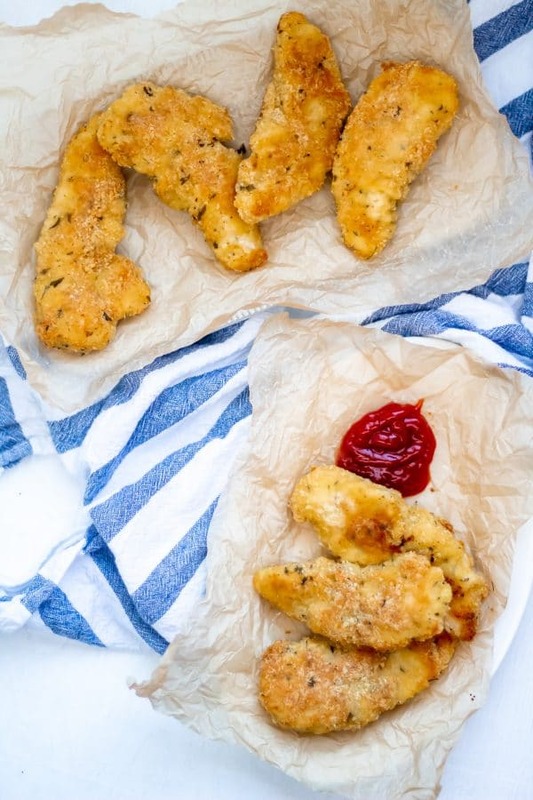 These garlic parmesan chicken tenders totally fit the bill. For one, they’re a baked chicken tender. This eliminates a lot of extra saturated fat and often even trans fat found in fried chicken tender options. 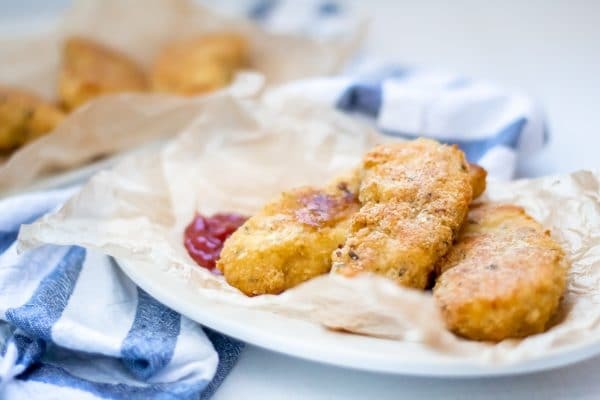 But because the chicken tenders are coated in almond flour, parmesan, and dipped in egg, they still offer a variety of mostly healthier fats. 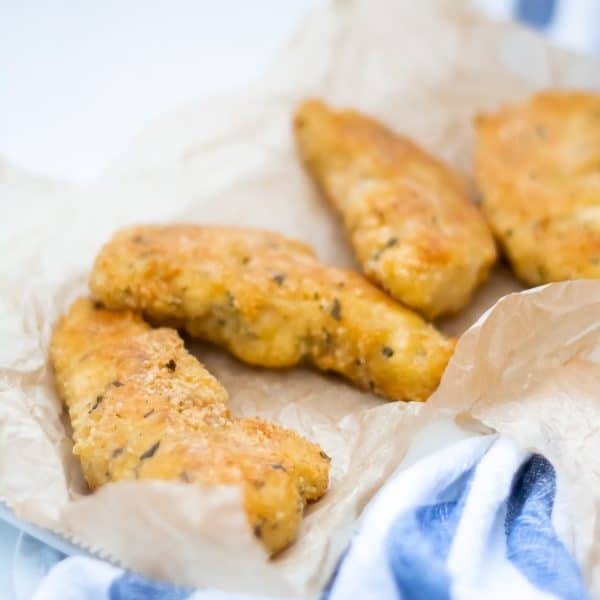 Additionally, the almond flour used instead of bread crumbs gives a higher fiber alternative to traditional bread crumbs that has a more stabilizing effect on blood sugar. Pat dry your chicken breast tenderloins and set on a large plate. Whisk together eggs in a wide shallow bowl for your egg dip. 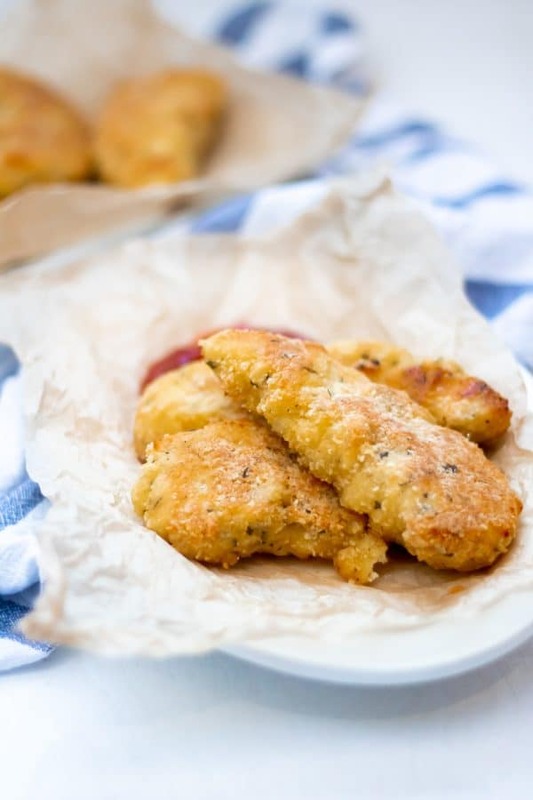 Whisk together your “breading” – the almond flour, parmesan cheese, and seasonings – in another shallow, wide bowl. Then you’ll just dip each chicken tenderloin into the egg dip and then the breading. You could totally stop there, but I found these garlic parmesan chicken tenders were ultra delicious when they were double dipped. So after you dip the tenderloin in the egg and the breading, place it back in the egg for another quick dip and then back in the breading for coat #2. 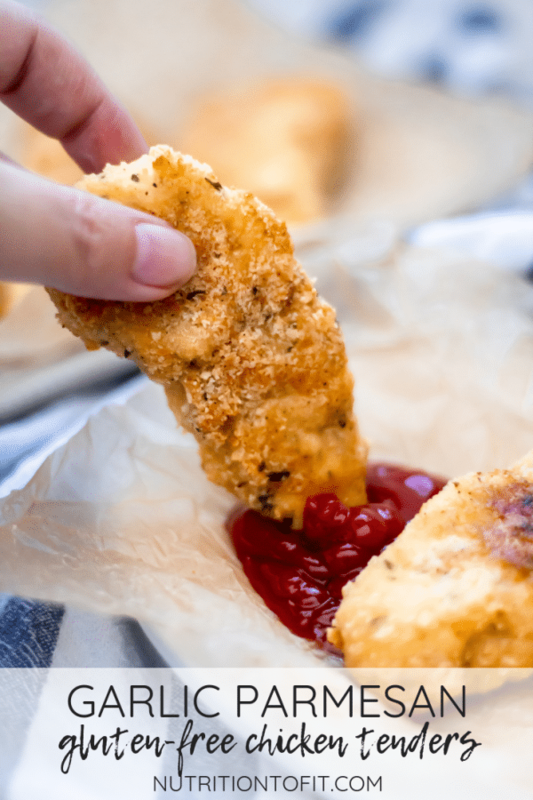 I’d also like to note that when you’re dipping, it’s important to try to maintain a “wet” hand (egg hand) and a “dry” hand (breading hand). What this means is that, say, your left hand will be the hand that handles the chicken in the egg dip. Then once you remove the tenderloin from the egg dip with your left hand, just place it in the shallow breading bowl and use your right hand to pat the breading mixture into it. Then use the right hand to place it back in the egg (don’t actually touch the egg! ), left hand to pick up and place back in the breading for coat #2, then right hand to pick up the breaded tenderloin and place it on the baking sheet. Speaking of the baking sheet, don’t forget to very lightly brush it with a touch of avocado or olive oil. These chicken tenders are baked, but you still want to get a nice coating to them. So I found that lightly brushing your parchment paper or silicone baking mat lined baking sheet with oil helps, along with lightly brushing the tops of the chicken tenders before placing in the oven. Alternatively you could use a single-ingredient oil spray (one that just contains olive or avocado oil but no propellants or other chemical fillers). To also help promote even browning and crispness, I also recommend carefully flipping the tenders halfway through baking. Then, while you don’t have to do this step, I really like turning my broiler on for a couple minutes under the broiler at the end. This will just help make them even more crisp and brown! But it’s important to be super careful, because your food can go from perfectly browned to burnt in a matter of seconds under the broiler. Always keep an eye on it – this is not the time to do dishes or walk away! Whenever you make an NTF recipe, I’d LOVE if you could leave a comment and rate the recipe, to help out both me and anyone else looking to make a recipe! It also totally makes my day whenever you share a picture of your NTF creations to social media – always be sure to tag me (@nutritiontofit, #nutritiontofit). Live well! Preheat oven to 425 degrees. Line a baking sheet with parchment paper or a silicone baking mat. Lightly spray or rub olive oil or avocado cooking spray on the baking mat. Set aside. Pat chicken tenderloins dry with a paper towel. In a shallow dish, whisk together the eggs. In another shallow dish, mix together the almond flour, parmesan cheese, garlic, parsley, salt, and pepper. Dip each tenderloin into the egg mixture, then into the parmesan almond flour mixture. For a thicker breading, do a second dip in the eggs and then almond parmesan mixture again. Place chicken tenders on the prepared baking sheet. To help tenders get evenly browned, lightly brush or spray the top of the chicken tenders with olive oil or avocado oil spray. Bake for 10 minutes. Carefully flip chicken tenders and bake another 5-6 minutes. If your tenders aren’t as browned and crisp as you’d like, turn your broiler on high and broil for 2-3 minutes. Be SUPER careful and watch closely so they don’t go from crispy to burned! Remove from oven and let rest a couple minutes before transferring to a serving platter or plates. Enjoy! 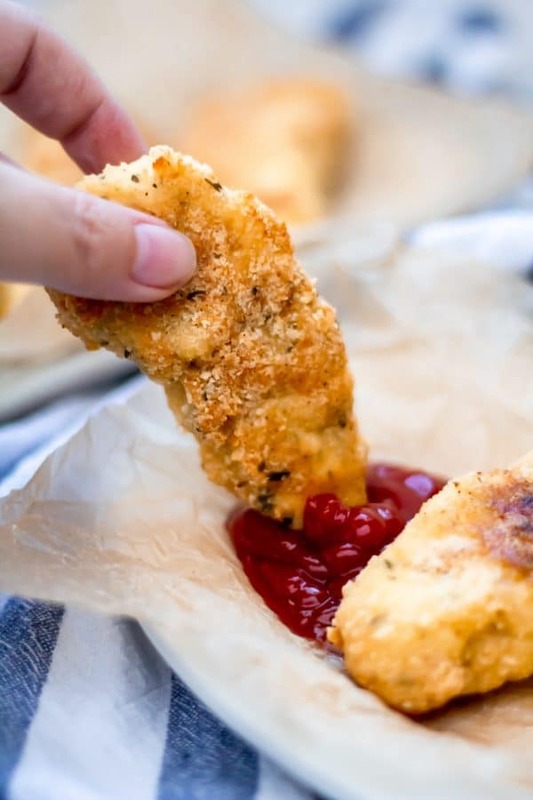 This recipe is written for the second dip of egg and breading - if you’re only dipping once the nutrition information will vary and you’ll end up with leftover egg wash and almond parmesan breading. Please don’t save it as it’s had raw chicken and egg in it!